The Royal Britannian Guard of Britain was re-established after the Great Divide was eradicated and the Crown formally recognized regiments under its command. The current Captains of the RBGB is Capt. Halston Montil and Capt. John Anderson, who continue to work hard to safeguard their beloved city. Currently, the RBG of Britain seeks able bodied cadets to join its ranks. Boot camps for cadets lasts 6 weeks and rate of starting pay is 10,000 gold per week. Britain territory covers the city and its outlying areas. From Marble Island all the way to the Guard Post at the Britannian Crossroads (Britain/Yew/Skara). From there it expands north to include the Training Outpost just north of Wind and then east to the Covetous Crossroads (Cove/Minoc/Vesper) and back to Marble Island. Your general disposition should be pleasant, friendly, and of service to the population. That doesn’t mean that you cannot have certain character traits, for example… playing the “bad cop” in an interrogation or a domestic dispute. There are many characteristics that you can apply to your persona and still remain part of the RBG. You could even secretly go rogue, or turn vigilante, or take bribes as part of your role play. Just be ready to be expelled from the organization should you be found out; maybe even brought up on charges of Treason. Keeping the secrets might be a lot of fun. An officer’s life can include a wife/husband and children. These can be either actual player characters or just appearing through your role play. You have a set schedule (which isn’t like a real life schedule) that the Captain will issue you. Your role play should reflect that schedule. What you do outside of your schedule can be up to you. Just keep the integrity of the organization in mind at all times. There are many ranks within the RBG that you can take. Always remember that our top-end report is the Royal Commander, who serves the Crown and has ultimate authority over all chapters. CAPTAIN — The Captain is in charge of the entire association. They answer only to the Royal Commander (part of the RBG RP theme and played by the EM’s). No one can apply for this title as they are the stoneholder. Currently, Halston Montil serves as Captain with Co-Captain John Anderson serving the large capital city of Britain. LIEUTENANT — The RBG can have many Lt.’s working on various storylines and arcs. This is an earned rank, appointed to you by the captain. You have the responsibility to contribute and/or create storylines for those ranks below you. SERGEANT — The RBG can have many Sgt.’s working on various storylines and arcs. This is an earned rank, appointed to you by the captain. You have the responsibility to contribute and/or create storylines for those ranks below you. DETECTIVE — Detectives specialize in the stealth arts and are often asked to investigate areas of Sosaria for clues within established storylines. The RBG can have many Det.’s working the cases. SENTRY — Sentries are in charge of guarding the RBG headquarters, as well as providing security for Britain itself and any events that they may be engaged to serve in such capacity. PATROLMAN — Patrols do just that. They are assigned posts in certain areas of Sosaria to continuously patrol and report on. They are not often involved in cases. RANGER — Rangers are specialized archers that are called to serve for specific storylines or arcs. They are the “snipers” if you will of our operation. JAILOR — Jailors are in charge of all prisoners, warrants for arrests, and records thereof for all captured player characters. ADMINISTRATION — Receptionists, Secretaries, Records Keepers, Court Reporters, Legal Counsel… just about anything you’d like to role play as part of a “police department” that you feel would be fun to play. The RBG of Britain has a required uniform that all members must wear for meetings, events, and all public attendances. For combat of any kind, you can wear what you like but it must reflect our colors, which are Black and White (like the Britannian City Flag) and your particular rank sash. Every member of the RBG of Britain is responsible for their assigned tasks as listed above in your rank. 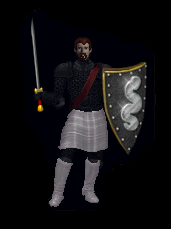 All newly trained cadets are hired at the SENTRY level and depending on your goals, you can move up from there to Detective > Sergeant > Lieutenant OR you can take a specialized post such as Patrolman, Ranger, or Jailor. Folks can also contribute to the RBG theme by taking on administrative roles as well. This special unit of the RBG of Britain services the King as his own “Secret Service”. 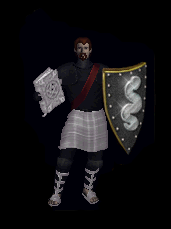 This unit is symbolized by the use of the CHAOS shield, rather than the traditional Order of the Serpent shield. If you wish to be part of the BB, you must be available to attend all or most of the King’s personal events where the he is present. First and foremost, all characters will be asked to submit in character storyline updates as requested, whether that is in the form of incident reports, disturbance calls, patrol logs, or whatever else is fitting. Remember that our main goal is to create a ROLE PLAYING world and everything we do must support that. The site helps to keep folks informed and it allows them to contribute to the story. RP that happens naturally can’t always be documented, we understand that, but main story arcs should be to allow others a chance to participate in their own way. 1) Submit an application (Below). 2) Register on this website’s forums using your character name as your forum user name. 3) Complete the BOOT CAMP requirements. 4) Interview with the Captain. Have you picked up a copy of the Training Procedural Brochure? Yes, I have started my boot camp sessions. Have you successfully registered on our forums? Yes, I have my account set up. Please give us your forum user name.